[D]uring the three nights I spent at the headquarters, I heard the screams of women and men who ISIS was torturing. [T]o hear the screams of the people of my city when they are being tortured at the hands of strangers is a torture of another type, which has destroyed my dignity. It seems that this city is no longer ours, and we have become strangers here, then I began to seriously consider leaving it. The group is named after al-Khansa, “a devout Muslim who dedicated poetry and eulogies to jihad fighters after losing four sons in a war against Persia at the time of the Prophet Mohammed.” In August, The International Business Times reported the majority of the women are of Chechen descent, but women from Afghanistan and Yemen have also joined. There are allegedly over 50 women in the gang in Raqqa. 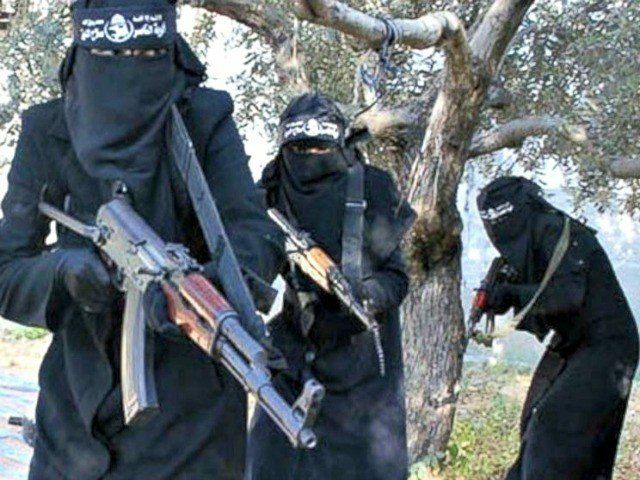 These women “are wives of immigrants in Syria, of Tunisian, Moroccan, French and British nationalities.” British women Glaswegian Aqsa Mahmood, 20, and Khadijah Dare, 22, are among the women in the al-Khansa brigade. Even though the Islamic State treats women as second-class citizens, some Western women have flocked to Iraq and Syria to join its forces. Women associated with the terrorists openly declared they wished they were the ones who murdered American journalists James Foley and Steven Sotloff. Salma and Zahra Halane, 16-year-old twins from Manchester, England, went to Syria to join their older brother. Both girls married Islamic State fighters, and one said she wants to be a doctor for the militants.